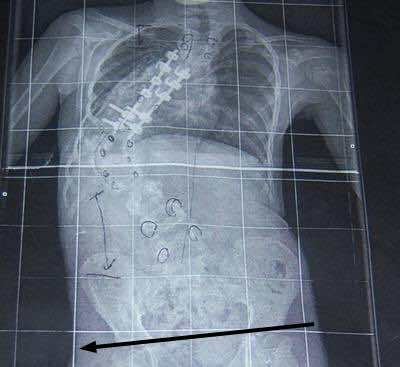 This is a bad scoliosis obviously, but could you have a short causing a less serious tilting of the pelvis? Hello, my name is Heather. I have degenerative disc disease. I've had 3 disc removed from my cervical spine and a plate put in. And I have had a full R hip replacement; the reason for that was necrosis. My hip replacement was done 3 yrs ago; right after it was done the joint popped out 3 times. I don't know if that is normal. But it's been ok till here recently. Been having pain also in the left hip as well. Pain in both growing areas and on both outside hip areas, one under the buttock and in back. Feels as if a vice grip is tightening and squeezing them very tightly. Can't sleep. Hard to drive. And hard to walk. My right knee is becoming very painful as well when walking. I am going to an orthopedic surgeon next week; he is checking my knee and L hip but won't look at my R. I have to sign a release to get my medical because I had that surgery out of state. I'm really scared to keep going like this because I feel something may be really wrong with the hardware. Frankly, there's a lot going on here; it could be primarily from your back, your sacroiliac joints, your hip, or other. The surgeon will examine you thoroughly and advise from his point of view. Here are a few pointers meantime. 1. Try to decide where YOU think it's coming from; bend slowly forward, backwards, to the side and get a sense of where it really hurts. Pull your knee to your chest, make a circle with it; is it in the hip and groin? 2. Ask someone to stand behind you, place both hands on your iliac crests, and get a sense of how level your pelvis is; you may have had a short leg all along, or the hip replacement may have increased or lessened that; as you bend forwards, do you look like the leaning tower of Pisa? A simple inexpensive insert in your shoe can make a world of difference. Go to Chiropractic Help and in the navigation bar on the left you'll find the site search function at the top. Type in "leg length inequality". Follow the links. Read. Try to understand. Ask the surgeon to confirm or deny and comment when you see him. 3. Start doing some gentle lower back exercises every morning before getting out of bed; mobilise that left hip. 3. Necrosis usually happens when there's not enough blood getting to the joint. Smoker? Not well controlled diabetic? How is your diet? Are you enjoying the mandatory 5 - 8 coloured foods every day? With you having degenerative joints all over, I suspect what you are eating, or not getting, may be the underlying cause. And of course your weight is vital; obese people all get hip and knee joint disease. If walking is difficult, find a swimming pool and go every day. I hope this contributes. I find it encouraging you are trying to help yourself; keep at it.